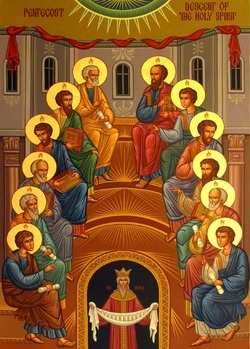 The real beginning of the history of the Church, is the feast of Pentecost of 30 AD On the tenth day after the Ascension of our Lord Jesus Christ, His disciples, His Mother, some other holy women and some of those Jews who came to believe in Him, (about 120 in all) were gathered in a home on mount Zion. As was usual, they were spending their time in prayer and in awaiting the promised Holy Spirit, when all of a sudden there was a noise from heaven as of rushing wind that filled the whole house where they were. And there appeared tongues of fire that spread out and rested on each person. And they were filled by the Holy Spirit and began to converse in other languages. This day was the Jewish feast of the Pentecost that commemorated the giving of the Law on Mount Sinai. Because of this there were many people in Jerusalem from different lands. When they heard this unusual noise in the air, they started gathering near the house where the apostles had been. They were surprised to hear, each in his own tongue, the wonderful works of God. "And they were all amazed . . . saying one to another, 'What meaneth this?' Others mocking said, 'These men are full of new wine.' But Peter, standing up with the eleven, lifted up his voice and said unto them, 'Ye men of Judea and all ye who dwell in Jerusalem, be this known to you, and hearken to my words. For these are not drunken as you suppose, seeing it is but the third hour of the day [nine in the morning according to our time]'" (Acts 2:12-16). The time of fulfillment of the prophecies had come, when the Spirit of God would come down on those faithful to Him. "Ye men of Israel, hear these words: Jesus of Nazareth, a Man approved of God among you by miracles, wonders, and signs, which God did through Him in the midst of you, as ye yourselves also know - Him, being delivered up in accordance with the established plan and foreknowledge of God, ye have taken and by wicked hands have crucified and slain. But God hath raised Him up, having loosed the pains of death, because it was not possible that He should be held" (Acts 2:22-24). These words of Peter, suggested to him by the Holy Spirit deeply moved the people, and on that day about three thousand people were baptized in the name of our Lord Jesus Christ. Such was the beginning of the spreading of the Gospel, that through the apostles and their disciples it first spread throughout Judea, and then throughout the world. From the time when the Holy Spirit passed over the apostles like "a sound from heaven as of a rushing mighty wind" (Acts 2:2) and when "there appeared unto them cloven tongues as of fire, and it sat upon each of them" (Acts 2:3), they became different people. Those, who had just recently ran in fear from the garden of Gethsemane, now began a world-wide bringing forth of the Gospel. They were not to be stopped by threats, torture, or death. They were followed by ever new generations of witnesses and martyrs for Christ. Mighty rulers armed against them, philosophers opposed them, great temptations were put in their path - but crucified, burned, perishing in the arenas of gladiators, they stood firm in the strength of the Holy Spirit. Troubling waves of false Christians, unworthy pastors, false teachers and dissenters crashed over them - but nothing can destroy the Church of Christ. In the words of our Divine Teacher: "I will build My church and the gates of hell will not prevail against it" (Matt.16:18).